Joaquín Sorolla was born in Valencia in 1863. As a two-year-old boy, he was orphaned, and cholera ravaged him in 1865. So he’ll be taken in by his uncles with his sister Concha. Chimet, as he was called as a family, studied drawing at the Escuela de Artesanos de Valencia and the Escuela de Bellas Artes. In his formative years he would paint, and between contests, he would win some prizes. 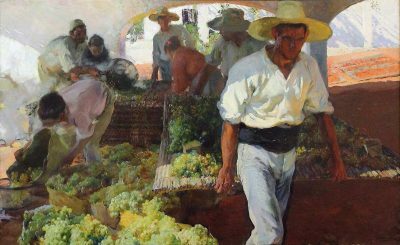 Sorolla was already a recognized painter, but his consolidation would come through the creation of “Luminism”, he painted light in a masterly way. He was a prolific artist who left a legacy of more than 2200 works. One of his facets as an artist was the portrait, he painted countless personalities, including Alfonso XIII. He died in Cercedilla (Madrid) in 1923.